A snuggly hoodie in soft stretchy cotton. It is new without tags. The hoodie has a long sleeve and white stripe down the side. It has a pouch to warm your hands and of course, a hood! 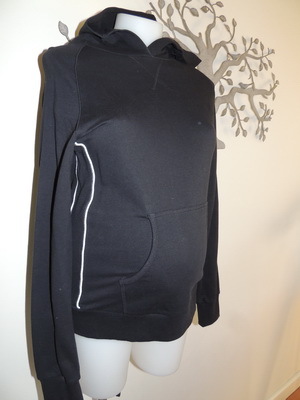 Be the first to review “NEW Black Maternity Hoodie” Click here to cancel reply.